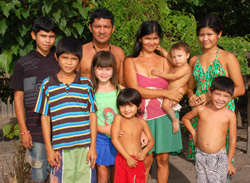 Felicita is 36 years old and married with two sons who are 10 and 14 years old. She started learning to make handicrafts when she was 11 years old and continues to make them today as an important source of income for her family. 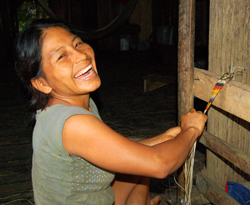 The Center for Amazon Community Ecology began developing a close relationship with Felicita and her family in 2009 when the group began a pilot project in the Bora native community of Brillo Nuevo in the Ampiyacu River region of Peru. Felicita’s husband Rolando was CACE’s first local coordinator for our copal resin project in the Ampiyacu while Felicita helped us bring together artisans in Brillo Nuevo through her leadership in the village handicraft association that included her mother, aunts and cousins. Working with these creative mostly-women artisans hasn’t always been easy. 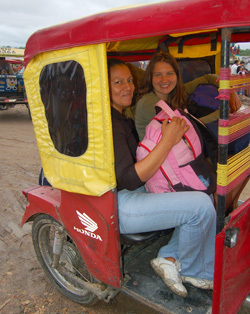 They were used to working by themselves or with a close family member, guarded their best techniques and sold their hammocks and bags on their own to buyers in the town of Pevas (where the Ampiyacu River enters the Amazon River) or vendors in the city of Iquitos. The artisans were alternately curious, welcoming and skeptical about CACE’s proposal for them to work closely with us and each other to develop and sell new and more crafts. They liked the idea of making more money by reaching other markets, but many women resisted requests to finish their pieces on time and fix them until they were almost perfect. By tapping her deep patience, craft skills, and diplomacy, Felicita helped convince the women it would help them all to share their talents and weaving tricks with each other. Thus began a few informal workshops in the open air living room of her home. 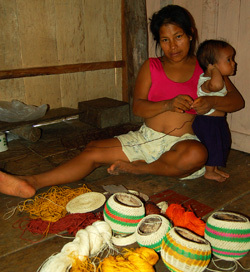 When one woman got stuck sewing thin strands of chambira fiber into oval eyes of a snake-pattern guitar strap, another would take it up and finish it. Felicita’s family life has gone through some significant changes in recent months. 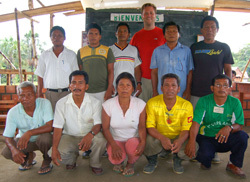 When Rolando won a position as a local representative, they moved to the town of Pevas. His salary allowed them to have a better standard of living, but their oldest son had a very rough time adapting to his new surroundings. He become rebellious, had problems every day and was missing a lot of school. Felicita and her husband recently decided it would be better for Bill to go back to Brillo Nuevo to finish his studies among his people. 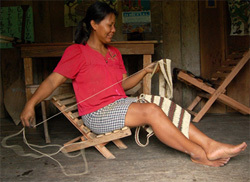 Felicita had already began to teach Bill to make some crafts, and he has become a good artisan in his own right. 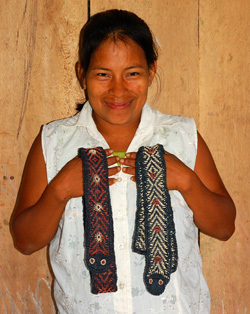 Felicita is still making handicrafts for CACE as part of the Brillo Nuevo artisan group. She return to her village to live some day. 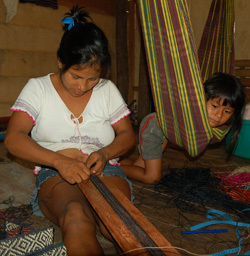 On Saturday, May 21, Felicita and her aunt Ines Chichaco are both going to do a live demonstration of their craft making via video conference from Peru and speak with guests at Spirit of the Amazon. This party is a fundraiser for the Center for Amazon Community Ecology. Please join us if you can. You can also DONATE to CACE on line to support the group’s conservation and community programs. Michael Gilmore is an ethnobotanist—or a scientist that studies the relationship between plants and people—and an assistant professor at George Mason University’s New Century College. 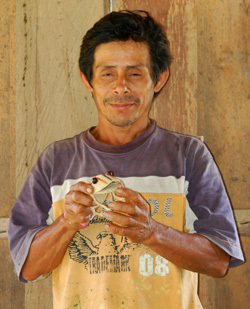 He has collaborated with the Maijuna of the Peruvian Amazon for more than 10 years. Gilmore is currently completing a four-year project that maps the Maijuna’s natural resources and their cultural significance. 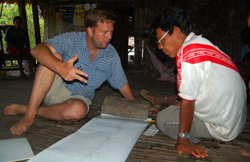 He is collaborating with Plowden and other researchers to preserve the biology and culture of the Maijuna. Gilmore is a key Center advisor and board member. Gilmore believes in community-driven research. He doesn’t ask what he needs, but what the community needs. “Right now the Maijuna children only know a small fraction of what the elders do. They don’t know the important plant species,” he says. That’s why Gilmore’s next goal is to set up an ethnobotanical garden that facilitates this type of learning in the Maijuna community. Gilmore has a big laugh accompanied by a hearty handshake and boundless energy. 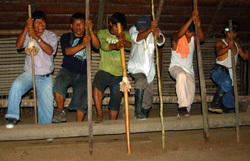 The Maijuna are a group of about 400 people in four villages in Loreto Province, Peru. In the last few years, the villages have united to form a federation in an effort to block the development of a proposed road that would destroy their ancestral lands. [See Editor Update at bottom of article]. The Maijuna trust Gilmore, and they have appointed him an official advisor to their federation, FECONAMAI. Gilmore likewise greatly respects the Maijuna. “The Maijuna said, ‘We’re saying no to this road, and that’s final,’” said Gilmore. 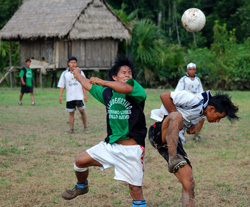 “Indigenous people in Peru have been incredibly marginalized. They’re not looked at as people by some in Peru, but as animals. For them to get up, to say something really powerful, that takes a lot of guts.” The future of the road—and of the Maijuna—is still unknown. Gilmore said that something was missing from his undergraduate biology curriculum at Colorado State University. He wanted to learn about the human component of biology. After college, Gilmore and a friend “wandered about Indonesia” for four months. 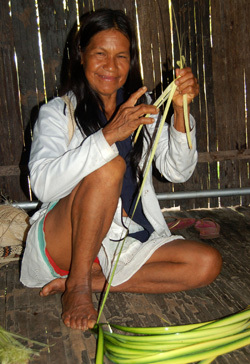 They visited small indigenous communities where they learned to make loincloths and bows and arrows from local plants. “I was impressed by how integrally involved plants were in these people’s lives,” Gilmore said. After his trip, Gilmore knew what he wanted to study—the relationship between plants and people. True to his character, Gilmore thought big and wrote a letter to Richard Evans Schultes, the father of modern ethnobotany. “And he wrote me back!” said Gilmore, still surprised and flattered today. Gilmore earned his PhD in botany from Miami University. He first visited the Maijuna with his advisor, ethnobotanist Hardy Eshbaugh, and then returned a year later after learning basic Spanish. Gilmore now also speaks basic Maijuna. What have the Maijuna taught Gilmore? 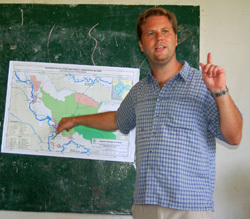 Editor’s Update: According to a conversation with Dr. Gilmore in early May 2011, the political climate in the Peruvian province of Loreto has shifted to support for creating a Regional Conservation Area that would include the four main Maijuna villages and the forest in between. The completion of a Rapid Biological Inventory of Maijuna lands conducted by the Field Museum of Chicago and Gilmore’s mapping work will support this process. This protected status would effectively halt plans to put a road through Maijuna ancestral lands. We’ve all heard the statistic: One football field of rainforest is cleared every second. But have we considered who is doing the cutting? We picture loggers or ranchers branded with corporate labels, or maybe we don’t dare let ourselves think about it at all, lest it be linked to us. Torres, 61, now works to provide new economic opportunities for rural Peruvians, so they don’t have to choose between providing for their families and conserving their forest. 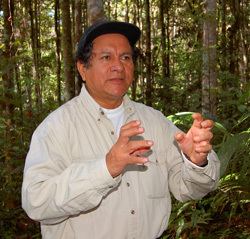 Torres is the former president of the governmental Peruvian Amazon Research Institute, or IIAP, and the current director of its Terrestrial Research Program (PROBOSQUES). 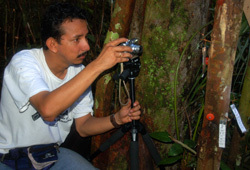 IIAP operates the Jenaro Herrera Research Station, a natural laboratory in Loreto Province where the Center has conducted most of its copal research since 2006. Before joining IIAP, Torres worked with the United States Agency for International Development (AID), the World Bank, and the European Commission. 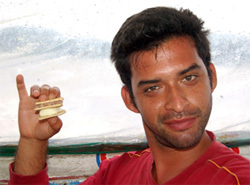 He has lived in Madagascar, West Africa and Bolivia. Torres got one chance to go to school, and he took it. On a recommendation of a priest passing through his village, Torres applied for a highly competitive scholarship to attend college in the United States. And he got it. First, he headed to Washington D.C. for one year to learn English. In 1984 he earned his PhD in soil science from Mississippi State University. Torres traveled the world, learned French, Malagasy, and Kreole, and raised four children. And then, ten years ago, he went home. “Peru, the forest, this is my place,” says Torres. 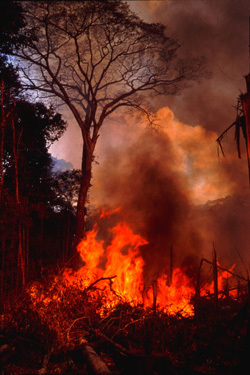 He is currently studying carbon sequestration, or the capacity of forests to store carbon gasses. Climate change — and the gasses that contribute to it — Torres’ greatest environmental concern. 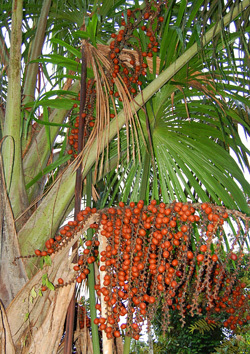 He’s also studying alternate ways to harvest aguaje, a popular palm fruit with a scaly shell, large seed, and thin orange-yellow pulp. 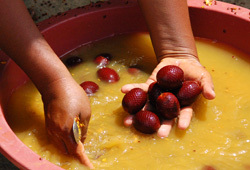 The city of Iquitos, the marketplace of the Peruvian forest, consumes two tons of aguaje per day. The fruit is used in many beverages and foods, especially ice cream. Most aguaje is currently harvested by chopping down the tree. IIAP is encouraging harvesters to climb the trees instead. It’s also breeding shorter aguaje trees that will produce more accessible fruits in fewer years. (See IIAP video about aguaje). Torres says that it’s essential for Peruvians to start exporting products with added value, rather than just raw materials. That’s why the Center’s project to develop copal and other non-timber forest products has potential, he says. It’s been a busy year at the Center for Amazon Community Ecology. The Center is advancing its research on the ecology of copal resin, developing new projects to turn copal and other plants into sustainable sources of income for forest peoples in the Peruvian Amazon, and establishing strong relationships with several indigenous communities. In the summer of 2009, the Center and its team in the Bora native village of Brillo Nuevo gathered and distilled hard, black copal resin into a golden, sweet-smelling oil, which has commercial potential in the fragrance industry. 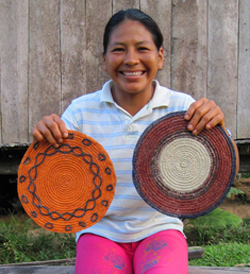 The Center continued to collaborate with several communities of artisans and began to build an online store that will market handicrafts and other items from the Amazon. Center President Campbell Plowden also joined a team of researchers committed to working with Maijuna native communities to preserve their culture and natural resources. This spring Plowden returned to Brazil to check in with Tembé and Ka’apor Indian villages and other traditional communities as potential Center partners. 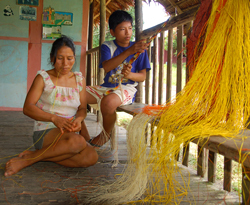 The Center’s laboratory is a network of small communities in the Peruvian Amazon. There are few roads here, and most days are hot, humid and buzzing. To get around, the Center team travels by boat and peque-peque, an elongated motorized canoe. Here is a whirlwind tour of the team’s travels and accomplishments this year. 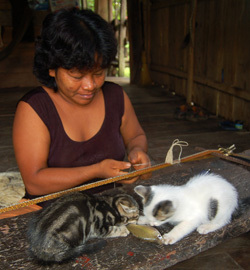 Brillo Nuevo is a village of about 425 people and 82 families in the Ampiyacu River region. It is blanketed with thatched roofs, about a quarter mile of sidewalk, a cinder-block school, and two soccer fields. 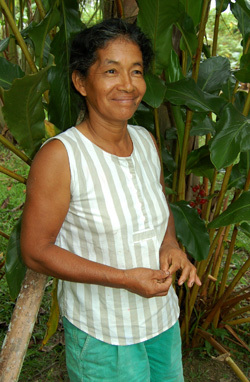 The villagers speak both Spanish and their native language, Bora. 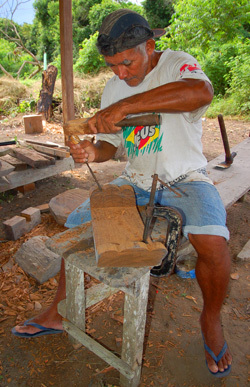 The Center began working with Bora woodsmen and artisans in 2008. It is now developing a two-part non-timber forest product project in partnership with the Federation of Native Communities of the Ampiyacu (FECONA) and the Instituto del Bien Comun (IBC) with financial support from The Rufford Small Grants Foundation and the Marjorie Grant Whiting Center. The copal project began in the summer of 2009 when Plowden, agronomist Yully Rojas,and six Bora woodsmen conducted a five-day rapid inventory of copal trees on about 95 hectares of upland forest near Brillo Nuevo. 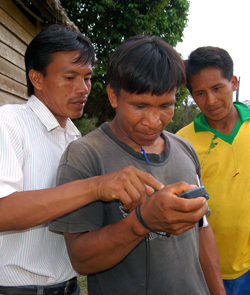 The Bora team learned to measure the girth of the copal trees and to record their location with a GPS device. The team harvested about half of the resin lumps, leaving the other half containing young weevils to continue producing the next generation of adult weevils and resin lumps. The team then distilled four batches of resin into a pale-yellow oil using a copper alembique, or a traditional distillation pot. According to Haley van Oosten, president of the L’Oeil du Vert fragrance company, copal oil could become a unique and valuable ingredient in some blends of fine perfumes. 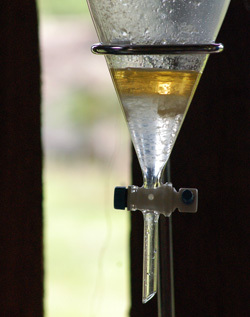 Producing this oil could then give the communities a profitable source of income. 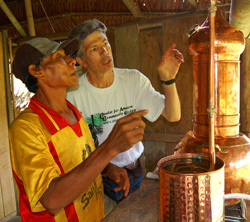 Project manager Rojas and local coordinator Rolando Panduro are now leading monthly searches for copal in the region and distilling the resin from different species to find the varieties, ages, and techniques that produce the best aromas. If the first phase of the project is successful, the Center will work with the communities, non-governmental partners, and government agencies to implement a sustainable harvest system for the resin and to develop a self-sufficient local enterprise. The Center is also working with the Bora and their Huitoto and Ocaina neighbors by encouraging several dozen skilled artisans to brainstorm new crafts and ideas in a series of workshops. Inspired by the patterns of local snakes, the Bora women are weaving chambira fibers into elegant belts with stunning, colorful designs. They are also creating snake pat terns for custom guitar straps and spider web designs for shopping bags. The Center will help market these items buy exhibiting them at presentations, craft fairs, reptile club meetings, and its online Amazon Forest Store. 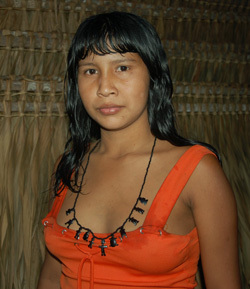 The Maijuna are a native group with about 400 people who live in four villages in the Napo River region of Peru. The group has formed the Federation of Maijuna Native Communities (FECONAMAI) to halt the loss of their land and language and improve basic conditions in their communities. 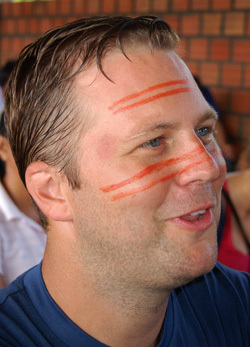 Michael Gilmore, an ethnobotanist from George Mason University and Center board member who has collaborated with the Maijuna for eleven years, invited Plowden and other researchers to attend the 2009 FECONAMAI Congress in the village of Sucusari. With the enthusiastic approval of the Maijuna, the researchers formed a team to support federation efforts to preserve the biological and cultural diversity of the Maijuna. The team includes German Perilla, a veteran bee-keeper who will teach the Maijuna how to produce honey for sale, and Christine Beier, a linguist who will document the Maijuna language and encourage its teaching in schools. 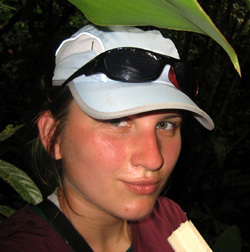 Gilmore is currently finishing a project that maps the interaction between plants and people on Maijuna lands. 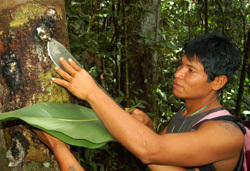 Rojas and Maijuna woodsmen who surveyed the lands around the Maijuna village of Nueva Vida were encouraged by the abundance and diversity of copal trees and resin in the region. The Center also interviewed about three dozen Maijuna women, who said they were interested in selling handicrafts through the Center, but would first like to attend workshops to increase their craft-making skills. 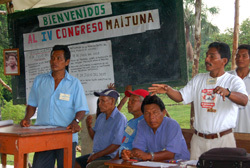 Rojas again attended the FECONAMAI Congress in 2010 (read Maijuna Congress account in Spanish) and won formal approval for a Center project with Maijuna villages when funds become available. The artisans of Chino are talented basket-makers. 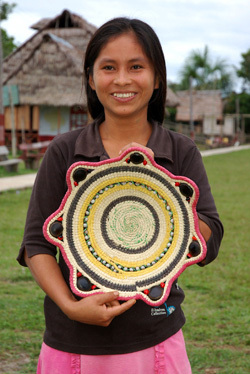 Their “paneras”, or flat baskets, are tightly woven and elaborately decorated with rainforest seeds and carved wooden pieces. In addition to paying artisans individually, the Center returns 20 percent of its handicraft sales from that community to support needs in the areas of health, education or conservation. With almost $600 in cr aft rebates received so far, Chino has chosen to buy notebooks and pencils for school children, desks for the school, medicines for their pharmacy; electric wires and lightbulbs for village common areas and food supplies for women replanting chambira palm trees. Jenaro Herrera is a town of about 5,000 on the Ucayali River. It has a few paved roads, motorcycle taxis, several convenience stores, and many water buffalo, whose milk is used to make the town’s famous cheese (See CACE video: Introduction to Jenaro Herrera). 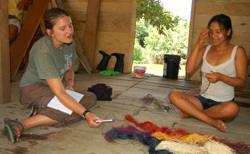 The Center conducts most of its copal research at the Jenaro Herrera Research Station, which is an internationally recognized outdoor laboratory operated by the Institute for the Investigation of the Peruvian Amazon (IIAP). 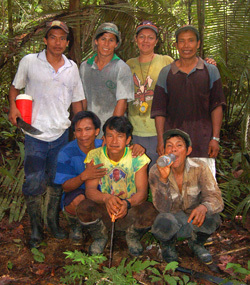 Project manager Angel Raygada, who is an agronomy student at the National University of the Peruvian Amazon (UNAP), and the local resident brothers Italo and Melaneo Melendez have been monitoring over 300 study trees in the station’s arboretum, natural forest and copal plantation for the last three years. The copal team has been learning about the development of resin lumps and observing how weevils and bees interact with the copal tree. 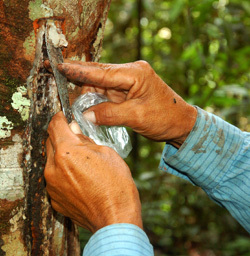 They recently completed a two-year study about the yield of resin produced through the manual wounding of copal trees – the most common technique for collecting resin in Central America. The Center has begun to collaborate closely with Dr. Paul Fine, an evolutionary biologist at the University of California at Berkeley, to determine how many weevil species are involved in this fascinating system and to explore how these weevils stimulate more or less resin on some trees depending on the chemical and physical features of its resin and bark. The team has encountered many challenges. The research station is legally protected, but intruders have still harvested resin lumps, destroying years of data. 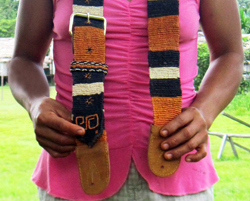 The town of Jenaro Herrera is home to many artisans that create jewelry and belts out of chambira and local seeds. The Center now works with several small cooperatives including Artesanias Wicungo, which specializes in making earrings with carved coconut shells. 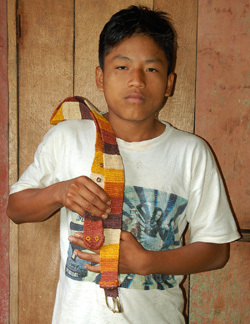 Jenaro Herrera also has also benefited from Center sale of handicrafts from its artisans. The school principal has used these funds to buy many basic materials for the school, including first aide and cleaning supplies, paper, a printer, a volleyball net and a soccer ball. Center director Campbell Plowden did his first studies on non-timber forest products with the Tembé Indians in the eastern Brazilian Amazon. During a recent month-long trip to Brazil, Plowden reconnected with many Tembé and Ka’apor colleagues he once worked with in the Gurupi River region. He learned that many things have changed in these communities in the past ten years. On the positive side, greater support from state governments has improved health and education services through better staffed clinics and schools. On the down side, the same roads that were built to facilitate these improvements also led to the expansion of illegal logging into the heart of the indigenous reserves – now often with the support of community leaders. Unchanged is the community’s need to generate revenue without causing severe damage to the forest. Plowden visited an old friend who lives in the Ka’apor village of Xi’e and found that this group is now making a range of beautiful necklaces, bracelets and rings from the carved nuts of the tucumã and inaja palm trees. 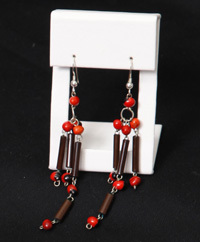 The Center is now exploring ways to help market this natural jewelry in the U.S. 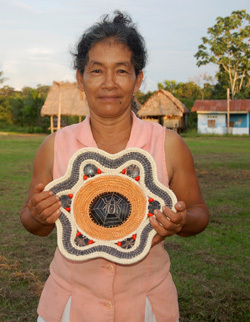 Some Tembé are still making beautiful crafts, but since many of these contain feathers from macaws and other wild birds, the Center cannot buy nor sell these items. Plowden said, “One highlight of the visit to Xi’e was jumping into the back of the community pickup truck one afternoon with a bunch of kids and the seedlings of the ipê tree that they had grown in a rustic nursery. 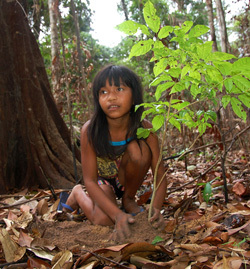 We drove out to an area that had been occupied by some illegal colonists and planted the seedlings there in a first effort to encourage the recovery of the natural forest.” One other project the Ka’apor are investigating is collecting seeds that may be sold to other reforestation efforts. 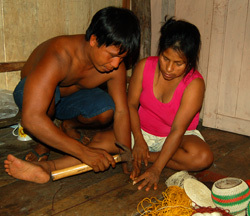 Plowden also spent time in several caboclo (traditional forest dwellers) communities along the Tapajós River to learn about the progress of their furniture-making enterprise. Instead of logging, the six communities are trying to generate income by selling hand-crafted benches, tables and animal figures from downed wood or carefully cut trees. 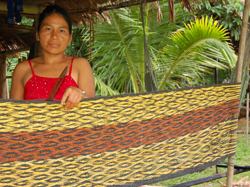 Since some of their designs are woven from vine roots, the Center may work with the project’s lead organization, the Amazon Research Institute (IPAM in Portuguese), to help communities develop a plan to sustainably harvest this non-timber resource.